England, in the past, hadn't had plenty of impact players, especially in the limited overs format. They had been denied the World Cup on three occasions when they had come too close yet were too far. Paul Collingwood had burst out into the international arena in 2001 on the back of his form for his county side Durham. He hasn't tasted an enormous amount of success throughout his career, however, he was a player of astounding dedication, capable of contributing to the team in all aspects. As a fielder, he was placed in the same league as Jonty Rhodes. This was particularly evident when he pouched a stunner off Harmison to dismiss Matthew Hayden in an ODI at Bristol in the year 2005. As a bowler, he was more inclined to being a dibbly-dobbly one, but given the right conditions, he could run through any batting order like a fast bowler who bowls with an express pace is capable of doing. As a batsman, he wasn't a devastating stroke-player, however, had enough range of strokes who qualifies to be a player of substance. His initial years of international cricket, he was just destined as a substitute player. Collingwood's introduction to English colours was an inauspicious one, scoring only two runs and ending up with no wickets. His role in the Ashes 2005 was minimal but one of the most important draws in the 5th Test was secured by Paul Collingwood along with Kevin Pietersen. With this, England won the Ashes series from Australia after a span of 19 years. The turning point was when he scored 96 and 80 in the first and second innings respectively trying to match up Pakistan's mammoth total in a losing effort. He followed up with a brilliant century at Nagpur in 2006. His defining moment in terms of being a batsman was when he collected 433 runs, with a glorious double century in Adelaide. Little that, it was the preamble to one of the shattering defeats in English test history. Collingwood bounced back by scoring 379 in the Commonwealth Bank tri-series featuring Australia and New Zealand. Collingwood scored consecutive one-day centuries against New Zealand and Australia followed by a crucial half-century against Australia in the second final to secure their first overseas one-day trophy in nine years. His form slump in 2008 led to him being dropped from the test team and to resign as captain of the one-day team. It wasn't long till he took back the reigns of the T20 team in 2009 and a year after that he propelled England to their first ever global tournament, by winning the 2010 T20 World cup at the West Indies, being the first captain to do so. They won the tournament in style, beating Australia in the final convincingly with Collingwood hitting the winning runs. The end of a successful Ashes series 2010-11 in Australia marked the end of his test career. A poor run in the World Cup led to him being dropped from the England limited overs side. 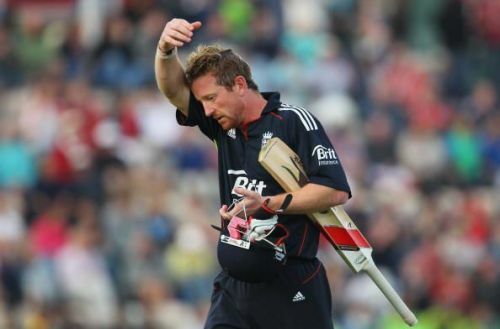 He was appointed English cricket team as a limited overs consultant in September 2015. His first-class career for Durham still went on well beyond his 40th birthday. In 2014, he led Durham to the Royal London One Day Cup under torrid circumstances and to add a feather to his cap, he picked up the "Player of the Year award". In 300 first class games, Collingwood has cumulated over 16000 runs and collected 163 scalps. On 13th September 2018, Paul announced his retirement from cricket, having played a little more than 300 international games for England. Collingwood was never the most gifted cricketer and had been in and out of the side, mainly because a tussle with Flintoff had always been there. But there was so to admire about how he fought his way through most of the talented players of his time through sheer determination. A captaincy role had brought the best out of him when after nine years as a captain he catapulted England to a feat which no captain of the England side could ever do. He was a natural athlete with a light-hearted temperament who has been a forgotten but an invaluable servant of English cricket.